Brian Bell | Marinette EagleHerald Carney-Nadeau’s Brett LaFord shoots a fadeaway over Stephenson’s Tayler Moenette Friday at Stephenson. STEPHENSON — It’s been seven years since the Stephenson boys basketball team defeated Carney-Nadeau. In front of a packed house for the rivalry and homecoming game Friday night, the Eagles ended the Wolves winning streak with a 49-46 triumph. Baskets were hard to come by for both teams in the first quarter as Stephenson took a 7-5 lead heading into the second. Stephenson started the quarter with a 6-0 run on two baskets from sophomore Bryce Keuhnau and one from Starzynski before C-N’s junior guard Brett LaFord scored a basket inside. The Wolves had troubles with Stephenson’s 2-3 and 3-2 zone defenses, which led to contested shots and turnovers that turned into easy fastbreak baskets for the Eagles. 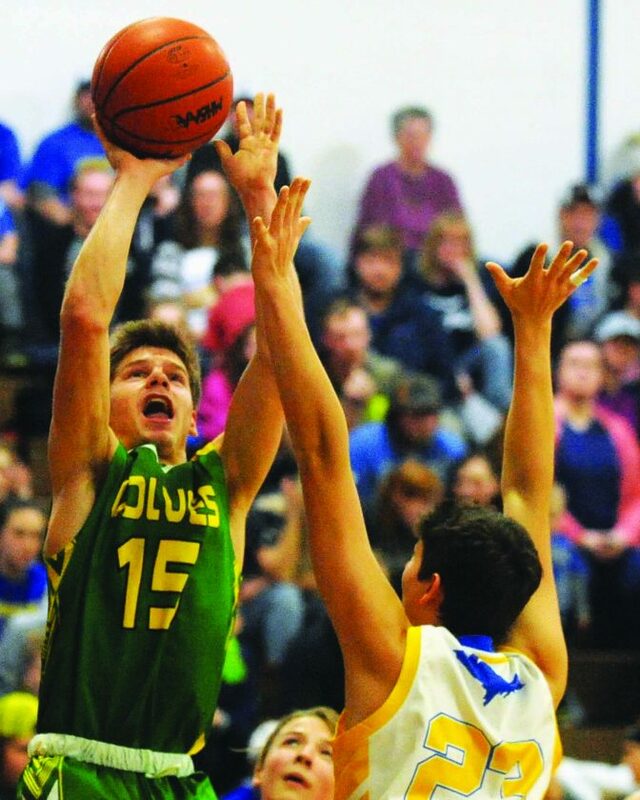 “I thought our defense was actually good tonight when we set it up, but offensively we were trying to dribble it through such tight spaces instead of swinging the ball and getting a good look at the hoop,” Wolves’ coach Jake Polfus said. C-N struggled shooting the ball from the field and from the free throw line all throughout the first half, which is a credit to the hounding defense of Stephenson. When the Wolves went to the free throw line, the team shot 3-11 in the second quarter and the Eagles finished on a 12-5 run behind eight points from Kuehnau and took a 25-12 lead into halftime. “Everyone knows Carney is notorious for shooting threes so we wanted to make sure we got out there in the passing lanes and put a hand up in the shooters face and by doing that, it led to us getting some fastbreak points for ourselves to get a nice lead going into the half,” Stephenson coach Eric Panske said. Starzynski led the Eagles to its biggest lead of the night at 36-18 to start the third quarter by scoring seven points in Stephenson’s 11-6 run to start the half. LaFord answered by finding sophomore Beau Koffman in the corner for an open 3-pointer to cut the deficit to 36-21 as the Wolves took a timeout with 3:51 left in the third. C-N got the lead to single digits with a basket from junior Jacob Blahnik, a 3-pointer from junior Max Baumler and another 3-pointer from LaFord, but Stephenson scored the last three points of the quarter to go into the fourth with a 40-29 advantage. “In the second half we moved Brett from the high post and we started to swing the ball a lot better,” Polfus said. The Wolves made things interesting in the final quarter after Stephenson junior Ashton Barstow came off the bench and sank a 3-pointer to take a 43-31 lead. Koffman and Baumler hit back-to-back 3-pointer’s to get within 43-37 but senior Merlin Thoune was there to answer for the Eagles with a strong drive to the basket. After Baumler made 2-of-3 free throws, Thoune answered again with an identical drive to the hoop to go up 47-39 with just over three minutes to play. LaFord cut the deficit to 47-43 with 2:01 remaining with two baskets for the Wolves and that score stood until there was under a minute left. With 26 seconds to play, LaFord stole a pass and just as he got past the half court line, Starzynski was called for an intentional foul which meant two free throws for LaFord and the ball back for C-N.
LaFord went 1-2 at the line and went right back after he was fouled on a shot attempt for two more. He made both, bringing the Wolves within one at 47-46. Starzynski then missed the front end of a bonus and C-N got the rebound, but the shot missed and Stephenson sophomore Jimmy Coldren iced the game with two free throws with 1.8 seconds remaining. C-N was led in scoring by LaFord with a game-high 20 points; Baumler had 13 and Koffman added nine. The Wolves shot 14-45 from the field and 12-25 from the free throw line. Starzynski scored 14 points to lead Stephenson; Coldren had 12 and Kuehnau chipped-in 10. C-N hosts Bark River-Harris Tuesday. Stephenson – Starzynski 14, Coldren 12, Kuehnau 10, Thoune 4, Barstow 3, Monette 2, Cappaert 2. C-N – LaFord 20, Baumler 13, Koffman 9, Blahnik 4.